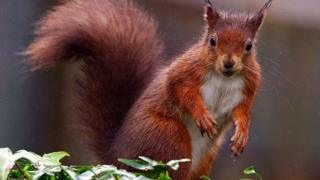 Red squirrels have been spotted in a south Cumbrian valley after a gap of two decades. The population in the Rusland Valley was devastated by the northwards march of the dominant grey squirrel, which carries diseases fatal to its red cousin, in the 1990s. A community project has been set up in a bid to boost numbers. People are urged to record sightings, offer food and set up traps for greys. It is not known whether the red squirrel population had entirely died out in the Rusland area, which lies between Windermere and Coniston, or had declined so much they were not seen. Bob Cartwright, from the Westmorland Red Squirrels project, said community action was the best way to bring about a "red resurgence". The red squirrel is native to Britain, but is now classified as "near threatened" due to the introduction of the American grey squirrel, which carries a virus fatal to reds. There are estimated to be only 140,000 red squirrels left in Britain, with more than 2.5 million greys.